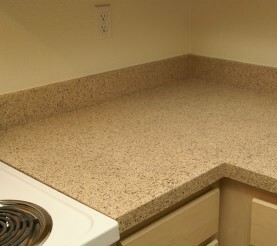 Countertop Repair – Can chips, scratches and burn marks be repaired? Like laminate, tile, and Corian® countertop surfaces, a refinished countertop can be cut by sharp knifes, accidentally scorched by hot pans or chipped. Even tile and Corian® surfaces can be damaged. 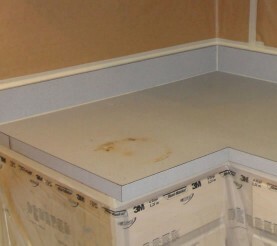 Fortunately, a Miracle Method refinished countertop can be repaired instead of replaced. Accidental knife cuts, burns and chips will disappear when professionally repaired by your Miracle Method technician. This scorched countertop looks like new! Countertop Repair – How do I find a Miracle Method Office? If your refinished countertop needs repair from accidental knife cuts, chips or burns, click Find a Location or call our toll free locator number, 1-888-271-7690, to reach the nearest Miracle Method professional.